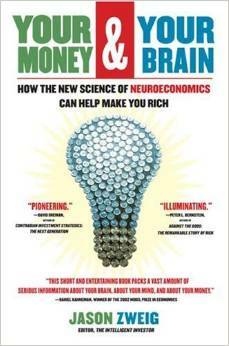 “Your Money and Your Brain: How the New Science of Neuroeconomics Can Help Make You Rich” aims at getting inside your brain when you deal with money, so you can make better and rational decisions about your investments. The book is written by Jason Zweig - a veteran financial journalist. "Your Money and Your Brain " is rare work on Neuroeconomics which is new field that combines Neuroscience and Economics. If you did not understand it, don’t worry. Just think of this fields as first cousin to behavioural finance with neuroscience technicalities added to it. Our brain is divided into 2 parts – the reflective/thinking part and Intuitive/emotional part. It is important to know - which one to use when - to be a successful investor. Being conscious about your decision-making can help you make fewer mistakes. Every chapter focuses on a particular category of behavioural finance - Greed, Prediction, Confidence, Risk, Fear, Surprise, Regret and Happiness. Every chapter starts by understanding neuroscience around the category to understand the brain, and ends by providing key insights into how we can reduce investing mistakes. Greed will be at play, when you invest. So, if you cannot control your greed, limit the impact by investing 90% in diversified index fund leaving only 10% for greedy bets. You can improve your prediction by asking for base rate. So if you feel return is going to be 50%, ask yourself what is the return of large sample over a long period. If the answer is 10%, you should rethink your prediction. You are most likely going to be overconfident about your estimates, so always cut your estimate by 25%. So, if you feel a stock should be valued at 100 USD, buy only at 75 USD. The best way, to avoid taking unnecessary risks, is to write yourself an Invest Policy Statement (IPS) and stick to it. This will make sure you have clear goals, and you will stick to how you want to meet these goals. When something goes wrong say market goes down, you will be fearful. One way, you can avoid taking wrong decisions say selling your stocks in low market, is by reminding yourself to do opposite of your feeling. If you are fearful, consider buying where as if you are excited, consider selling. Earning Guidance is one way companies use to hit your surprise button. Earning guidance is intentionally provided low, so when real earnings are higher stock shoot up. One way, to avoid the surprise trap, is to ignore earning guidance. We like to avoid feeling regretful, you can avoid this trap by simply diversifying portfolio across stocks and investment classes such as domestic stocks, international stocks, and bonds. Keep balancing the portfolio often, so you are guided by rules not feelings. Find a way to feel happy other than making money, such as find a hobby or attend a class. I highly recommend “Your Money and Your Brain ” to everyone who wants to understand neuroeconomics or behavioural finance. The book will certainly change you as investor, and you will become conscious about the way you deal with money and investments. If nothing else, you will make fewer investing mistakes.